The religious spirit looks down on others. It thinks it’s all right; that it doesn’t need to change. It is full of pride. When you have discerned that you are dealing with a religious spirit, the only thing to do is to get away from them. Because until the person comes into the realization and revelation that they have something DEMONIC that’s driving them to do things in church, or do ministry, or for a good cause, there is nothing that can be done for them. Religious spirits are SO insidious and subtle that its hard to recognize….at first glance. It takes TIME to observe a person in all their various atmospheres to determine if they have a religious spirit or not. A religious spirit knows how to look holy, righteous. 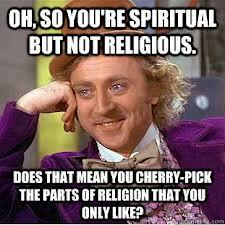 Just by first glance, you can’t tell the difference between a holy person and a religious one. The demon starts to manifest by then. When you have discerned that you are dealing with a religious spirit, the only thing to do is to get away from them. Because until the person comes into the realization and revelation that they have something DEMONIC that’s driving them to do things in church, or do ministry, or for a good cause, there is nothing that can be done for them. Religious spirits are SO insidious and subtle that its hard to recognize….at first glance. It takes TIME to observe a person in all their various atmospheres to determine if they have a religious spirit or not. 20 Signs of a Religious Spirit” are derived from the Book of Jude. 1. RIFT - One with a religious spirit believes he has a mission to tear down error or what he believes is wrong. 2. REBUKE - He has a hard time receiving rebuke from someone less spiritual than he. 3. REBELLIOUS - He will not listen to people, because he can hear from God. 4. REPULSED - He immediately notices what is wrong with people, or the church, rather than looking for what is right. 5. RIGOROUS - He keeps score on his spiritual life and carries guilt when he doesn’t add up to the Lord’s standards. 6. REJECTING - He feels as though he has been appointed to fix everybody else. 7. RIVAL - He may feel as though he is truly closer to God than others, and his life or ministry is more pleasing to God in comparison. 8. RANKS - He takes pride in spiritual discipline or spiritual maturity and ranks himself against others. 9. REPUTATION - He will do things in order to be noticed or affirmed by people. 11. RAUCOUS - Seemingly converse to the prior, a religious spirit will use emotionalism or hype to manipulate people. 12. RESISTANT - He will tend to resist the supernatural or reject spiritual manifestations he cannot understand. 13. REACTIONARY – He will overreact to carnality or immaturity in the body of Christ. 14. RENEGADE - He will not fully commit to a church or lend a hand to help if the group is not “perfect” in their theology. 15. REFRAIN - He will tend to be suspicious of or even oppose new moves of God. 16 . Religious people have no joy and, ultimately, no power! Nehemiah 8:10 declared that the joy of the Lord is our strength. It denotes that the person who lives in the dwelling place of the Lord (the place of joy—in the presence of the Lord there is fullness of joy) is reinforced with power. 18. Religion creates a form of godliness through regimen and repetition. Second Timothy 3:5 warns us to avoid people with forms of godliness. 20. Religion hinders positive relationships by putting a bad taste in the mouths of unbelievers, taking the fire out of marriages, stopping the flow of God in worship fellowships, and making children hate serving God. What do you do when you come across people with religious spirits besides not want to bless them out? Only God can deliver a person from a religious spirits but what you do in the meantime is not let them vex or bother you to the point to acting non-Christ-like. Just pray for them and hope that they allow God to change their erroneous beliefs on what and how to live holy for Christ. When you truly have a personal relationship with God meaning you do more than just serve Him but surrender your entire life to God, you can no longer have a religious mindset with God nor think you have Him all figured all out. That’s the ultimate crux of a person with a religious spirit, they profess to know all about God, but don’t truly know God. Selah. A religious spirit goal is to stifle, dry and deaden every church that may have had God’s Spirit and Presence reigning in the sanctuary. The Enemy sends religious spirits into churches to begin the process of hindering and blocking God’s Presence from healing, delivering, restoring, yoke destroying and breaking bondages or strongholds off of people’s lives. Once this process is complete, the church becomes just a building that we go to on Sundays without feeling the presence of God and not getting any spiritual breakthroughs in our lives. The religious church is a man-motivated, dead religious works oriented, carnal church that has a form of godliness void of the presence of the Holy Spirit. Little did Stephen know that God was going to use his death to launch a great apostolic revolution. After the vicious murder of Stephen the believers were “scattered abroad and went every where preaching the Word” (Acts 8:4). Religious persecution always results in the advancement of ministry. The Gospel of the Kingdom cannot be stopped. Only God can deliver a person from a religious spirits but what you do in the meantime is not let them vex or bother you to the point to acting non-Christ-like. Just pray for them and hope that they allow God to change their erroneous beliefs on what and how to live holy for Christ. When you truly have a personal relationship with God meaning you do more than just serve Him but surrender your entire life to God, you can no longer have a religious mindset with God nor think you have Him all figured all out. That’s the ultimate crux of a person with a religious spirit, they profess to know all about God, but don’t truly know God. Selah.